Fluctuations in weather will almost always wreck my skin. Whether it be change in air quality (I'm looking at you, dry and polluted Madrid air) or sudden change in temperature (now I'm glarin' at you, Florida winters), I struggle keeping my skin balanced. My combination/oily skin gives me SO much trouble. Like, how can my skin be so oily yet so dry?! What my skin really needed was something to balance it. 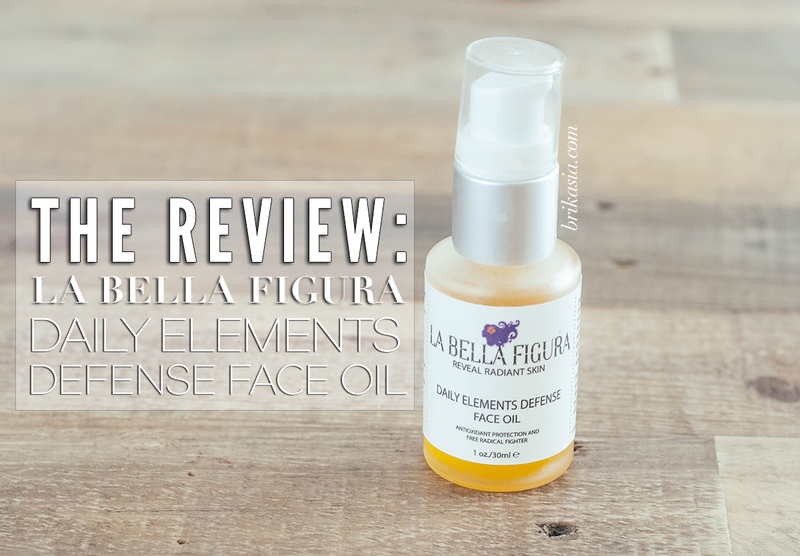 Which is why I'm grateful for La Bella Figura's Daily Elements Defense Face Oil. This antioxidant-filled oil wonder that Victoria from LBF so graciously gifted me has been crucial in keeping my skin tame. Click the "read more" link to see why this oil has basically turned into my e v e r y t h i n g.
Not only does this oil keep my skin hydrated and balanced, it also protects against UV rays and contains high dosages of antioxidants, omegas 3 and 6, vitamins, and other skin restoring minerals. This oil is ideal to use in the mornings before getting any sun exposure, as this will help protect your skin from harmful UV rays (yay!). And I'm sure you're thinking, "But Brianna, don't you have combination-oily skin? Wouldn't this make it look like there was an oil spill happening right on your FACE?!" Yea, I ~totes~ get your concern about this, but the crazy thing is that this doesn't make me a grease pit! If anything, this has balanced my skin so I actually am not getting as oily as quickly, if that makes any sense. Since I'm not depriving my skin of oil, my skin is pretty happy with my life choices and kinda chills out for a few hours before getting greasy. Don't get me wrong- I still need to touch up throughout the day because of oiliness, but using this oil does not exacerbate that issue. Hooray for that! And here's a little pro tip for you oil fiends out there: mix a drop of this oil with your foundation for some seriously gorgeous and glowy skin. When I get dry patches on my face, I mix some of this oil with my foundation and stipple the foundation on with my Beauty Blender sponge. And boom! Instantly radiant skin. Such a useful little trick, and seriously effective. So down to the nitty gritty: such a high-quality and luxurious facial oil does not come cheap. This oil rings in at $95 for 1 ounce of product. I totally understand that this isn't something everyone can go out and buy. BUT- if you are looking to splurge on yourself and give your skin some serious pampering, then I cannot recommend this oil enough. This oil is great for all skin types, and the La Bella Figura website mentions that this is best used in the morning after cleansing and prior to sun exposure or after outdoor activity to help soothe the skin and help reverse free radical damage. La Bella Figura sure knows how to spoil a gal. They've recently given their packaging a bit of a face lift, so the bottle you see above isn't what you'll be receiving if you buy this oil, but it's still the same liquid gold product, I promise. If you're ready to take your skincare to the next level, then I suggest starting here. You won't regret it. Disclosure: This product was gifted by La Bella Figura. All opinions are my own. That's great you found something that works well for you! I haven't tried this brand, but I always stalk their IG feed and drool!! You have got to try something of theirs! It's the ultimate luxurious experience. I'm obsessed with everything I've tried from LBF.